Frank Smets is Adviser to the President of the European Central Bank (ECB) since December 2013. Before his current position, he was the Director General of the Directorate General Research of the ECB. He is professor of international economics at the Centre for Economic Studies at the KU Leuven and an honorary professor in the Duisenberg chair at the Faculty of Economics and Business of the University of Groningen. 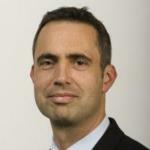 He is a Research Fellow of the Centre for Economic Policy Research in London and CESifo in Munich. Smets has written and published extensively on DSGE modeling, monetary, macroeconomic, financial and international issues mostly related to central banking in top academic journals. He has been managing editor of the International Journal of Central Banking from 2008 till 2010. Before joining the European Central Bank in 1998, he was a research economist at the Bank for International Settlements in Basel, Switzerland. He holds a PhD in Economics from Yale University.